CHATHAM — There's power in planting flowers. That's what the dozens of volunteers who came out Saturday morning believe about what has become an annual event, aimed at promoting the East Chatham neighborhood as a desirable place in which to live and invest. "I believe in this neighborhood and I believe in Chicago," said Folake Kehinde. "We want people, all people, to know that we care about our community." Kehinde owns and lives in a four-unit apartment building on Maryland Avenue just south of 81st Street, one of three intersections that served as neighborhood's focal point of Neighbor Works Day, an annual event spearheaded by Neighborhood Housing Services, aimed at beautifying communities citywide. 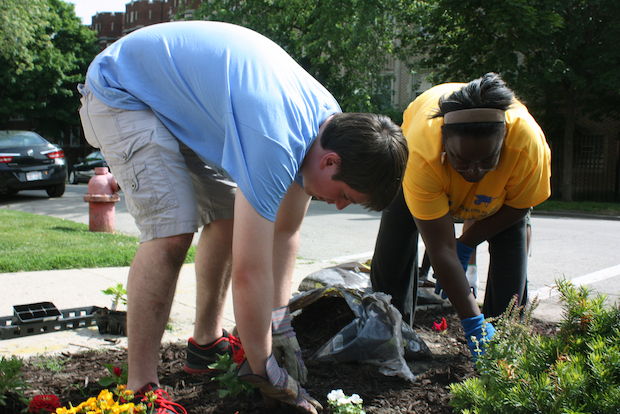 To the neighbors and members of various community groups that came out to plant perennials, annuals and shrubbery, focusing on these intersections — 81st and Maryland, 81st and Ingleside Avenue, and 83rd and Maryland — helps send strong messages to those visiting Chatham's residential blocks. "We are helping revitalize the neighborhood and bringing positive attention to these ports of reentry," said Eitan Feldman, owner of two apartment buildings along 81st Street. "People see this and they start feeling good about their neighborhood." The area around the intersections is part of one of the city's 13 Micro Market Recovery Program areas, which have been disproportionally hit by foreclosures and have been targeted by the city and organizations as needing help with investment. The beautification project came days after a forum that included Mayor Rahm Emanuel and U.S. Rep. Bobby Rush, as well as residents and business owners, who called for more jobs and educational opportunities to help Chatham reclaim its former glory. Travis Kluska, program officer for the Community Investment Corp., an organization that works to boost investment in that specific part of the neighborhood noted the part of Chatham east of Cottage Grove Avenue has struggled with vacancies and crime. He pointed out a particular building, 804 E. 81st St., a 20-unit building that had fallen into disrepair and was targeted by looters in front of which Jeromy Ellis was murdered in May. "We're always wondering about how we can reclaim these buildings for the community," Kluska said. That particular building is now the responsibility of Kluska's organization, after it won a housing court case to take it over. Community Investment Corp. is now looking for someone to invest in that building, something that could cost nearly $500,000. Small projects like corner plantings go a long way toward showing those from inside and outside the neighborhood that it is worth investing in, Kluska and others at Saturday's event said. A fourth intersection is slated to get a planting later this summer. "The corner parkways are gateways to these blocks," said Ald. Michelle Harris (8th), an avid gardener. "We're here to resuscitate the local housing market." Does Chicago Have The Strictest Gun Laws in the Country?